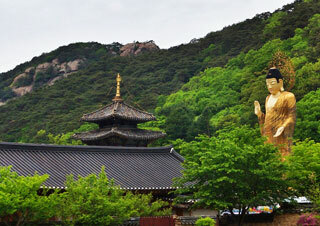 Beopjusa is a head temple of the Jogye Order of Korean Buddhism. It was initially constructed in 553 by Silla monk Uisin. It has been historically associated with Beopsang thought, and the worship of the Maitreya Buddha. This article uses material from the Wikipedia article "Beopjusa", which is released under the Creative Commons Attribution-Share-Alike 3.0 License.